I see I got another mention on WCNews today. It’s certainly flattering but I’m not so sure about this place being called “one of the most fantastic websites on the entire Internet”. I can imagine some dashed hopes when people actually click the link. However, in honour of the occasion I thought I should post something Wing Commander. 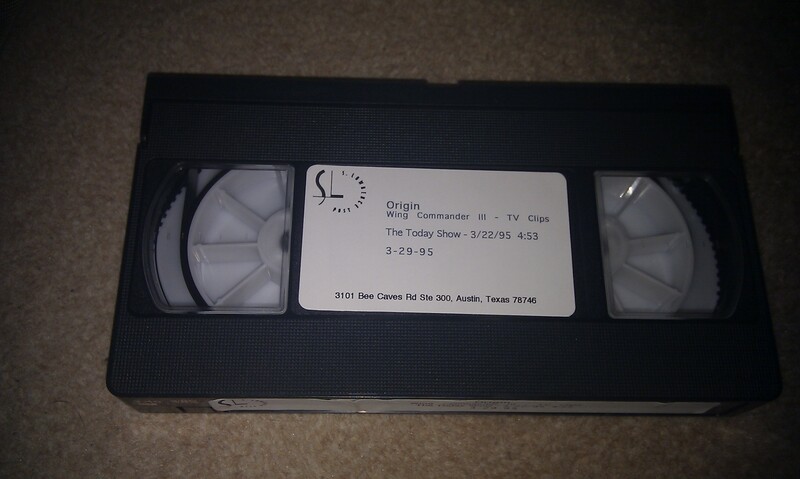 This is a short feature I’ve got on VHS from The Today Show on Wing Commander III. It has some behind the scenes footage and also interviews with Mark Hamill, John Rhys Davis and Malcolm McDowell. I can’t post anything these days without a short update on the VFX-1. I tried swapping to a floppy cable as a VESA connector and moving the graphics card to another slot and it has actually improved the picture slightly but it still doesn’t look as good as it should. I couldn’t find any other cards that worked at all but I did win the Trio64 for 99p so that is on the way and will hopefully do the job. However, I found a warning in my motherboard manual that old S3 cards could cause lockups so there is a strong possibility I won’t actually be able to use it. As a backup plan, I’m also going to buy an ET4000 if possible and have my eye on one on Ebay at a price I like. It’s in Papua New Guinea of all places but is still the cheapest option by a mile if I’m looking for one of the officially supported cards. Tempting as it is, I’m going to hold off actually playing anything on the VFX-1 until I get this sorted which could be some weeks if I’m waiting for a parcel from PNG. That should give me time to play another game or two in the meanwhile. I’ve been hunting around on some more Japanese auction sites and have picked up Ultima 6 and Ultima 1-3 for FM-Towns as well as a pair of Japanese Ultima cluebooks but I won’t be getting any of those for a couple of weeks. I think Ultima 4 on the NES has to be next.